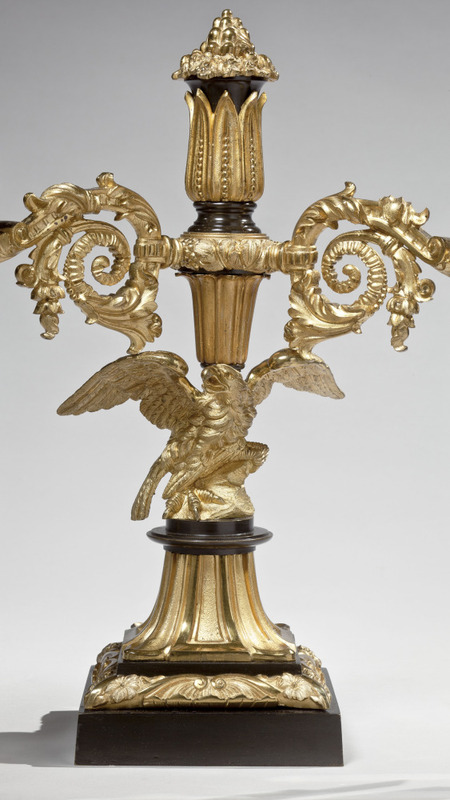 The central standard raising a finial above two scrolled candle arms with lusters hanging from the bobèche above a cast eagle perched on a stepped pedestal continuing to a stepped square plinth base. Stamped on the back of the eagles is: M & P.
Messenger & Phipson first appear in Birmingham city directories in 1797 on Park Street. 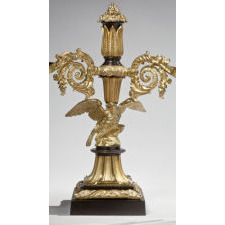 By1800 they were listed on Lovejoy Street and in an 1808 advertisement in a trade directory they describe themselves as: "Brass Founders, Manufacturers of Church Candlesticks, Patent Lamps, Etc.," at Broad Street. Between this date and 1812, the firm is believed to have employed as many as 250 men making it one of the largest brass manufacturers in Birmingham. In 1823, a year after opening a London office at 21 Greville Street, Messenger & Phipson are listed at 22 Broad Street, Birmingham. This is the final year of the association of Thomas Messenger and Thomas Phipson. Thomas Messenger continued in the business until his death in 1832 when the firm, under the name of Messenger and Sons carried on under the direction of his son Samuel. 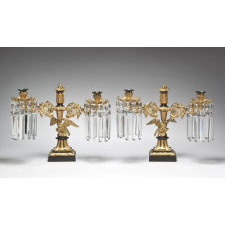 The firm continued as chandelier, lamp, lantern and ornamental brass and iron makers into the 20th century. 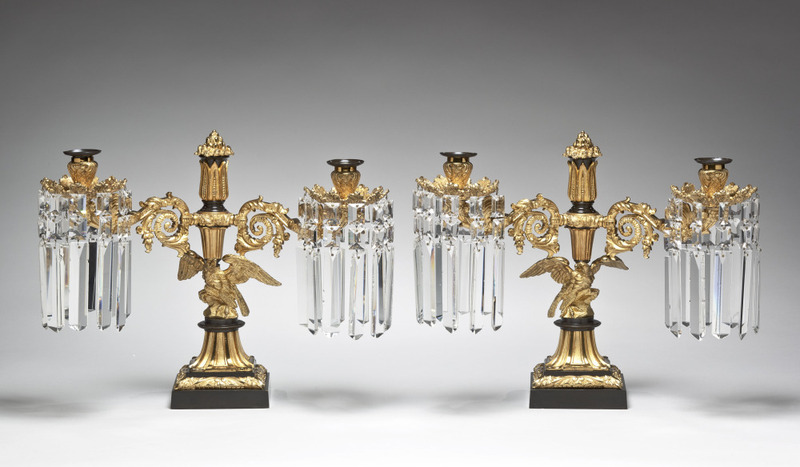 The firm had a substantial export business throughout the Classical period selling private labeled lighting fixtures to luxury emporiums like Jones, Lows & Ball in Boston and J. & I. Cox and Baldwin Gardiner in New York, Louis Veron in Philadelphia and their counterparts in Baltimore and Richmond,. Measurements H: 25" W: 14"